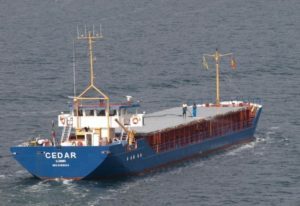 The general cargo ship Fom lost propulsion power after engine failure in Black sea on 65 nautical miles off Eregli, Turkey. The ship was en route to Kerch, Crimea under ballast, but suffered blackout after engine failure and started developing list to starboard, due to strong winds and stormy weather conditions. The crew was unable to restore the ship’s stability and requested assistance from the local authorities. At the scene of the troubled cargo ship was dispatched a Turkish Navy frigate’s helicopter, which evacuated all the eight crew members. All the people were in good health and without reported injuries. There is no immediate danger for sinking of the general cargo ship Fom, but due to safety reasons the salvage will be started after weather improves. The ship is adrift off Turkish coast and salvage operation will be started withing several hours. According to the salvage plans, the vessel will be ballasted and towed to Turkey, where will be repaired and inspected. The general cargo ship Fom (IMO: 8100624) has overall length of 73.00 m, moulded beam of 11.00 m and maximum draft of 4.00 m. The deadweight of the ship is 2,286 DWT and the gross tonnage is 1,499 GRT. The vessel was built in 1981 by Peters Schiffswerft at the shipyard in Wewelsfleth, Germany.